Here we go again. Joel Osteen is in the news once again, this time for saying that Mormonism is just another form of Christianity. Osteen, pastor of “America’s largest church,” as the media repeat over and over, was speaking to The Washington Times in an interview that covered a variety of issues. It was the quintessential Joel on display. Speaking to the newspaper on Monday, Osteen said, “I see faith in America at an all-time high.” His comments came just as a major research project detailed a significant loss of vitality in America’s Christian congregations. That loss of vitality can be traced, among other things, to a loss of theological and biblical conviction. Joel, of course, is proof positive that you can build a crowd without building a church. He is not inclined to deal in much theological conviction. That message includes some truth, of course - but it doesn’t even come close to the Gospel of Jesus Christ. Hell will be filled with people who bloomed where they were planted. Osteen just stated his belief that Mormons are Christians. He then expressed the thought that Mormonism “might not be the purest form of Christianity, like I grew up with,” but he affirmed Mormon statements that Jesus is the Son of God and that He is Savior. Evaluating Osteen’s boyhood understanding of Christianity would be a project unto itself, given the shifting theology of his preacher father, the late John Osteen. The main point of concern in Joel’s latest comment is the lack of any biblical standard of judgment and the total abdication of theological responsibility. He relegates doctrinal disagreements between Christians and Mormons to the status of theological debates between Protestant denominations and then includes Roman Catholicism. There are plenty of issues there, and the issues are not the same when comparing Baptists to Methodists, on the one hand, and Protestants and Roman Catholics, on the other. Comparing any form of Trinitarian orthodoxy with Mormonism is another class of question altogether. Joel reminded the paper’s staff that he has never attended seminary. This is true, of course, but there are thousands of preachers who never had the opportunity to attend seminary who have a sufficient grasp of and commitment to biblical truth that would prevent such carelessness. The little details of it? Mormonism does not differ from historic biblical Christianity in “little details,” and a faithful Mormon would be the first to point this out. Mormonism begins with a plurality of gods, not with the monotheism of the Bible. Jesus Christ is an exalted man - not the incarnate Word. The list of categorical doctrinal differences continues throughout the entire belief system. The very essence of Mormonism is the claim that historic Christianity is fundamentally in error, and that true Christianity did not exist on earth from the time of the Apostles until Joseph Smith. Mormonism can hardly be charged with hiding their movement’s teachings - the Book of Mormon and the other fundamental texts of the Latter Day Saints are published in plain sight. Here we face a fundamental dilemma. When Joel Osteen hears a summary of Mormon belief that mentions God assuming “the shape of a man,” does he lack the theological discernment to hear how that differs from biblical Christianity, or does it not concern him? In other words, does Joel not know, or does Joel not care? In the end, we have to conclude that he does not care enough to know, and that is the greater tragedy for a Christian minister. He doesn’t “get hung up” on doctrinal issues, nor has he “really studied them or thought about them.” His own words indict him. The Latter Day Saints include some of the most wonderful and kind people we will ever meet. They put a great emphasis on character and on the moral values of our common concern. They talk freely and passionately about their own beliefs, including their beliefs concerning Jesus Christ. Furthermore, they put action behind their commitments, sending their young people on missions and fueling a worldwide movement that remains one of the fastest-growing on the planet. But their beliefs concerning Jesus Christ are not those of historic Christianity, and their understanding of salvation differs radically from the message of the New Testament. It is the responsibility of every Christian, much less every Christian minister, to know this. 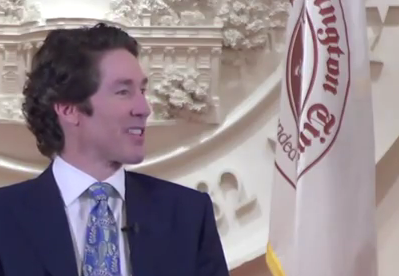 Joel Osteen told The Washington Times that he is constantly “looking for new ways to influence the culture.” Our culture admires those with low theological commitment and high emphasis on attitude. In Joel Osteen’s case, it is the secular culture that has influenced the minister, and not the minister that is influencing the culture.